Organic, seasonal, sustainability, locavorism—these are some words that are heavily thrown around in the food world. The power of their meaning might be lost to us now, but forty years ago these were the philosophies that founded Chez Panisse. Alice Waters is the mother of it all, the doyenne of slow food, and a great chef on top of it. Her restaurant has been dishing out simple and rustic food since 1971, long before organic became trendy. It's difficult to name even a handful of restaurants that have been around for that long. 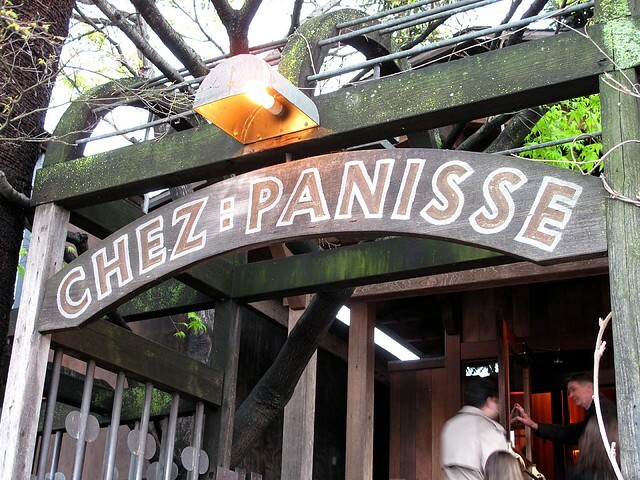 Chez Panisse is the Mecca of Alice Waters' brand of slow, organic, local food. The restaurant places emphasis on subtlety, simpleness, clean taste, and plainly beautiful food. On my recent trip to San Francisco, I spent much of my time in Berkeley, staying with a friend who lives just a street or two away from the restaurant. A group of us had a wonderful dinner in the upstairs cafe, which has the more affordable à la carte menu than the ground floor dining room's prix fixe. The menu that night was inspired by Julia Child. I couldn't have chosen a better night—reserved a month in advance, of course. From outside and within, the restaurant has a very rustic feel. We were seated in a booth right alongside the cafe's open kitchen, which features a wood-burning oven and charcoal grill. It was wonderful to witness the chefs and crew preparing meals out in the open. Much of the dishes are prepared in the oven, which adds superb flavor to simple preparations. That night the menu had a great selection of salads, all featuring seasonal produce. The cardoons with sunchokes and anchovy salad was robustly flavored and the anchovy was a nice touch without being overtly fishy. I was surely seeing a trend or an overabundance in sunchokes, because I saw it on the menus of every restaurant I visited in the bay area. Other salads ordered included a frisée with smoked bacon and crumbled egg--I presume a new take on the classic salad Lyonnaise. And the arugula salad with beets and grated celeriac was especially refreshing. It was a very nice way to combine winter root vegetables with spring greens. All the options for mains looked fantastic, and since there was a number of us, we all ordered different dishes so we would be able to try almost all. The pasta dish was such a humble-looking plate of my favorite pasta shape, gemelli. Instead of standard basil pesto, it was coated in arugula pesto. Dollops of ricotta cheese and sun-dried tomatoes dotted the dish. The halibut fillet was simply one of the best cooked I've had in a long time. The chervil butter added a nice herbal flavor without being as heavy as sauce might be. Green asparagus and baby potatoes made a nice complementary side. The shrimp entree featured Louisiana gulf shrimp. This was probably the only item on the menu that was not local. I'm glad the restaurant is supporting the community there. I hope more restaurants would do the same. Served over spinach and artichokes with gaufrette (waffle) fries and aioli for dipping, the shrimp dish was an excellent compilation of components. The oven-roasted quail was a little masterpiece: a tender gamebird cooked to perfection. The salad of escarole and radicchio was nice as was the crostini, but it seemed out of place paired with this dish. I would have expected roasted potatoes tossed in herbs as a better side. My philosophy is: dinner isn't complete without dessert. And how can you leave a restaurant like Chez Panisse without having dessert, especially on Julia Child night? The floating islands were a spectacular representation of a classic French dessert, Ile flottante. Here two cloud-like orbs of meringue floated in a pool of vanilla bean custard. Mandarin segments peaked out from under the eggy abyss and citrus caramel splatters along with almond flakes dotted the surface. The next dessert was a simple but excellent coffee ice cream with chocolate sauce. A cocoa nib meringue cookie rounded out this chocolate lover's dream. The final dessert, and in my opinion the pièce de résistance of the evening was the Pink Lady apple and sour cherry tart. The pastry was delicate and crumbly and the fruit perfect. A scoop of nocino (walnut liqueur) ice cream sat on the sideline, but whipped cream or no accompaniment at all would have been just as fine. The tart was simply the star. For a first-timer to the bay area, like myself, I can't think of a better place to start than Chez Panisse. The restaurant follows what it has set out to do. The food is simple, but it's created artfully and thoughtfully with high regard for quality of ingredient and execution. I am more than happy to have had the experience of dining at Chez Panisse and can't wait to go back again. Friday and Saturday 11:30 a.m. to 3:30 p.m. Closed Sunday. Prices range from $8 to $28.